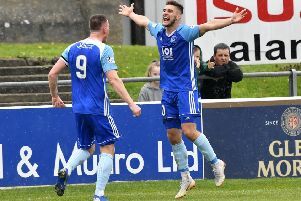 Peterhead FC boss Jim McInally has already begun the process of rebuilding his squad for next season’s Scottish League 2 campaign. Reports this week have suggested that the Blue Toon manager is looking to add former Stenhousemuir player Mason Robertson to his squad. McInally has also reportedly showed an interest in Albion Rover’s Scott McBride. Mason Robertson, son of former Rangers defender David Robertson - recently returned to Scotland from the United States and signed for Stenny until the end of last season after impressing as a trialist. The six feet two-inch forward, 22, scored against Peterhead in a 3-1 win for Stenny back in March. Meanwhile, winger Scott McBride is currently under contract with Albion Rovers. The 27 years-old, who started his career with Dunfermline Athletic, has also represented Raith Rovers, East Fife and Cowdenbeath, making him one of just a hand-ful of players to represent all four senior Fife teams. Although naturally a midfielder, McBride has also featured at left-back for previous clubs. Since joining Albion in 2015 he has made 29 appearances and scored nine goals. In other news, the draw for the group stage of the Betfred Scottish League Cup will take place this Friday, June 2. The Group Stage draw sees the 40 participating clubs placed into eight groups of five and scheduled to play four games across five match dates – 15 July, 19 July, 22 July, 26 July and 29 July (subject to broadcast selections). The format, announced in advance of the 2016 Betfred Cup, sees all drawn Group Stage matches go straight to a penalty shoot-out with the winners earning an extra ‘bonus point’ in addition to the point given for a draw. Last season saw Peterhead were drawn alongside Dundee, Dumbarton, East Fife and Forfar. The Blue Toon topped their group but would go on to be eliminated by Rangers in the next round.